Online betting is a lucrative industry with more and more punters looking for the most convenient way to place wagers online. While using online bookmakers via a PC has been popular for around a decade now, over the last few years mobile betting has really taken off. Today there are more apps than ever designed to make placing a wager on your favourite sport as simple as possible, and any betting enthusiast will be searching for the best possible choice for them. Convenience and ease of navigation are two of the primary concerns, together with the range of sporting choices available. Bwin is one of the best known online bookmakers and the Bwin mobile app is among the more commonly downloaded choices. So, is Bwin mobile betting the right choice for you? Here you can find out more about the Bwin betting app and its advantages and disadvantages. Bwin was an Austrian company, established in 1997 as betandwin, with its first online sports betting site launched in the following year. In 2001 they moved their base to Gibraltar and rebranded themselves as Bwin in 2006. In 2007, the company took the important step of branching out into live streaming of a number of major sporting events and although Bwin do have a casino gambling arm, their core business is still sports betting. They have sponsored a number of European sporting fixtures including the European and World Basketball Championships and Moto GP. Bwin is now part of the world’s largest onling bookmaker, with a customer base of more than 10 million people worldwide. 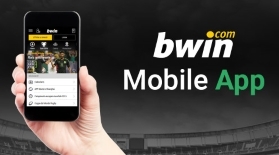 Having recognised the importance of mobile betting, Bwin have launched a Bwin mobile app to enable users to access content and place wagers while on the go. Which Platforms Can the Bwin Betting App be Used On and Which Sports are Available Through the Bwin Mobile Platform? Bwin mobile betting is available via a downloadable app for all major smartphones and tablets. Whether users have an Android or Apple iOS device, there is a Bwin app to enable bettors to bet on the move. Although there is a separate app for iPad and iPhone, there is very little difference between the two and both are equally smooth to use. While the Apple versions of the app are a little more visually appealing than the Android version, both are equally simple to use and effective with rapid loading. Users of Blackberrys and Windows phones can also use the Bwin mobile app. All of the available Bwin betting apps are easy to navigate and are visually appealing. If you choose not to use a downloadable app, it is still possible to use the Bwin mobile site through the browser. The Bwin mobile platform offers a huge choice of betting markets with more than 30,000 different bets and over 90 sports available to bet on. Bwin’s core market is soccer however there are plenty of other choices available, from the traditional favourites like motorsports and a range of ball games to the more exotic options of futsal, roller hockey and darts. All of these are available through the Bwin mobile app making it one of the best possible choices for any user who enjoys placing a wager wherever they might be. What are the Advantages and Disadvantages of Bwin Mobile Betting? The Bwin mobile app is very well designed, with a tabbed browsing system that makes it simple to find exactly the right market. There is even up to the moment statistics and information provided, giving users the means to make an informed choice of wagers. On all version of the Bwin mobile app the graphics are clear and smooth and the user interface is intuitive. There are live in-play bets available through the mobile app to make wagers more exciting and there is the option of placing both single and multiple bets. Bwin were one of the pioneers of live stream betting and they have lots of options in this sector including hockey, basketball and tennis as well as many football fixtures. There is a bonus offered to newly registered players who choose to use the Bwin betting app, and of course bettors can rest assured that their financial transactions are in safe hands, with Bwin being one of the most reliable and trustworthy online sportsbooks. There is a wide range of deposit methods available from the traditional credit and debit card options to the most popular e-Wallets such as PayPal and Neteller. Bwin have worked hard to ensure that all aspects of their PC website can be fully accessed via the Bwin mobile platform and so users can still view details such as their payment history, bonus status and past bets. Although there are very few downsides to Bwin, those who are fans of non-European sports will find that there are limited options for them to wager on with this sportsbook.